i thought, cinema dng could be the right format to open the rawdata into the bigger grading world, for example speedgrade and resolve. now we have to see. 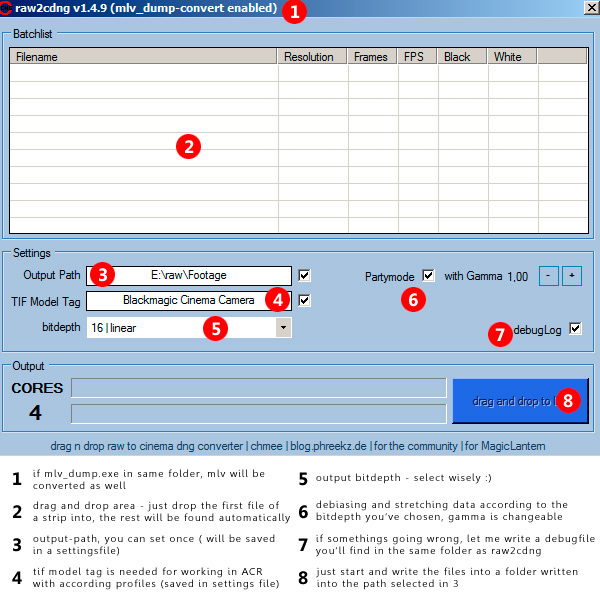 for now there is this tool for windows and the cdng-converter rawmagic for mac written by thomas worth. my github link was only for first discussion purposes. you will find the CinemaDNG-Dialog in the Magiclantern-Forum. – its just a raw to cinema dng converter – its NOT debayering! – made for windows-systems – not tested under emulators/virtualizers. – its coded from scratch and has nearly nothing to do with raw2dng! – this is a beta! need your response! – changed filename of pictursequence to section filename and sequencenumber with a dot. RESOLVE ROUNDTRIP IS WORKIN ! – i’m kind of pissed. instead of optimizing their debayer-modul (pink fringes all over the world), seriously reading/using the Reelname for xml, doin‘ some badpixel-support, noisereduction-tool or manual devignetting-sliders they have done the simplest thing. ok, its a free software – and i hope, they build this all into the newer v10-version – but thomas worth, a1ex, g3gg0, iliasG, fatpig and lots of other coders did a way better (free) work to make a handy environment to compete the ML_RAW-revolution. I#m now a little bit tired thinking about optimizations – by now i’m doin a pause – rethinking this tool – there are three things: simplifying convert-process, lowering datasize and opening as a commandline-tool. Ahh, forgot one challenge: accurate colors/whitebalance/colormatrices/LUT – we re talking about it in the ml-forum – in Speedgrade the problem is obvious. – this version’s got CR2-whitebalance-support. do a photo right before the movie record and put this one into the same path as the raw-file. name it as the rawfile. raw2cdng will recognise it automatically and read the RGGBValues asMeasured (from makernotes) and turn it into the whitebalance-data for the dng-files. ITS ONLY TESTED WITH 5DIII CR2-Files! If you recorded a whole set of same whitebalanced stuff, you name this file ALL.CR2 and all RAWs will get this whitebalance-value – except files havint their own CR2. This one’s is a first usability-test for photoshop, speedgradeCC and resolve10 users. by 90% stripping wont work. multithreaded. lowering blacklevel by 90%-button. changeable UniqueModelID for ACR-Profiles. framerate fixed. .look-file inside for speedgradeCC. *(4) Model ID not needed. * set/change gamma to 1.0 – its built in for testing purposes. * wrong characters in path or filename leads to failure. fixed. * partymode is now on by default, no click. version 1.5.0 is on new blogentry! – threading in conversion – speeding up the thing. thank a lot. i just prepared the code for some preprocessing-code. so vertical banding and chroma smoothing could be inside 1.5 🙂 BUT its depending on the clarification of the ml-team (a1ex?) about their GPL-License and using in my closed-source. we’ll see..
Hello, the app is great but today i was convert some RAWs from 5DIII with this app and on the sky I saw there is stripes! 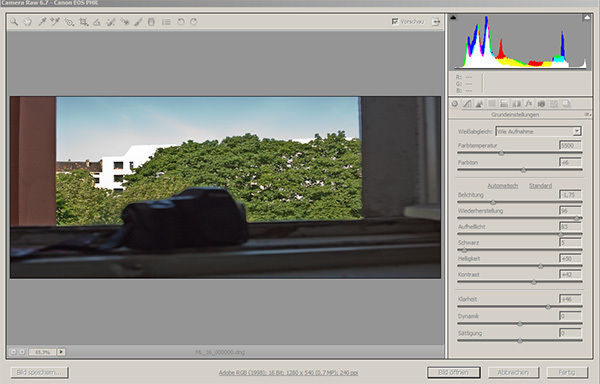 When i converted the same RAWs with classic „raw2dng.exe“ the picture is clear. Do you know where is the problem? read right above. its the vertical banding patch in raw2dng. try to implement it. I am having trouble with raw2cdng. Basically it crashes a lot, particularly when batch processing. I’m running it on a brand new fast PC and have had no problems with other programs such as RAWanizer etc. I’ve tried several versions, although the latest two 1.5 betas won’t open at all. Typically it will load the files just fine and let me select my settings, output etc. But when I click Start it crashes. I’m desperate to use Resolve as part of my workflow. Any ideas anyone? Dylan, please write things regarding versions =>1.5 into the according blog-entry 🙂 please be patient, to solve a lot of things i have to refine the debug-log (i’m already coding that) – i hope i will give a beta4 after the weekend.. I just tried the new beta and had no trouble. I think raw2cdng was crashing because the drive I was creating to wasn’t fast enough. 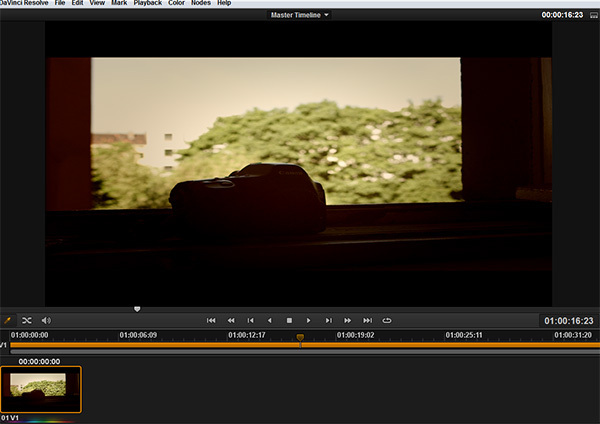 Thanks a lot for your work, from 5d mark 3 mlv raw 4gb to 32 gb (single file) can we get dng files out of it?. Sorry for my bad English . Thank you for the great work !! So, no, its not intended, but possible. yes, the properties are deleted in a 8bit-jpg or mp4. maybe there’s a bug inside my tool, if the proxy-pictures are too dark. send an example to raw2cdng@phreekz.de or talk in the ml-forum with me.